This hilarious article on abandoned Universities in Second Life got me thinking about 3D worlds and GIS. 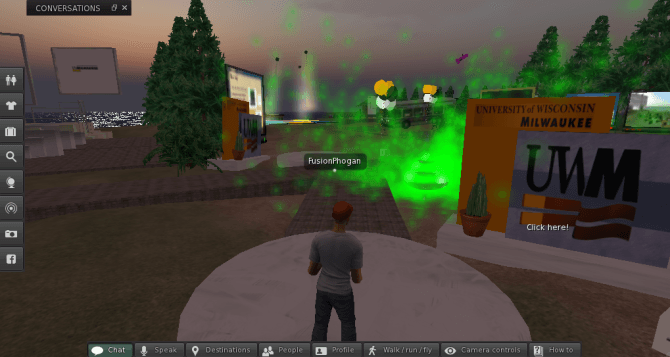 I mean seriously, what the heck were we thinking with Second Life? But while Second Life was more hype than function, KML and Google Earth was our great hope. KML export, Arc2Earth, SketchUp all were tools that were used liberally to export our GIS models to Google Earth in hopes we’d finally have a universal GIS viewer. My site is littered with KML export articles that we all thought would change our lives. But honestly none of them really have taken off. In fact I rarely create KML anymore, my clients just doesn’t use Google Earth anymore. So where is Minecraft in all of this? Safe Software has an Minecraft conversation as part of FME. If I look at the analytics to this site, most of the top 10 search terms have some tie in to Minecraft. But it feels so much different from Second Life or even Google Earth. I honestly have put some thought into licensing FME and putting up a GIS to Minecraft conversion service due to the interest in it. But are we exporting GIS to Minecraft for visualization? No but I think there is a different thing going on here. Minecraft is as consumer as we get. GIS is very enterprise and business focused. We’ve always wondered how do we get ordinary people to use GIS data1. What Minecraft does is bring all that analysis, data conversion, transformation and scripting into the mainstream. I can’t recall my son ever being so interested in anything as he is in Minecraft. I’m sure your kids are the same way. I’m still not really sure if Minecraft GIS is has any more traction than Second Life or KML for GIS professionals. It could very well be that in 3 years I’ll look back on this post and laugh at my words. But I’m betting that Microsoft will make Minecraft bigger than it’s ever been and Minecraft export format will be built into every GIS package.